Find hotel near Paradise Puerto Rico Wate ..
Paradise Puerto Rico Water Sports are one of the finest water sports experts in the area. They offer a wide variety of activities, which include snorkelling, scuba diving, sunset cruises, private parties, cruises to La Mona and a lot more. They also specialize in creating personalized water sports itineraries to fit tourist schedules and budgets. Paradise Puerto Rico Water Sports is one of the best locations for adrenaline junkies and vacation lovers alike. Their most famous activity is without a doubt, the Jet Ski tour. They offer different packages where you can Jet Ski across the Puerto Rico coastline, with a guide of course, and enjoy the beautiful waters at full speed. It is quite an experience. However, they have other fun filled activities as well! The banana boat makes for some hilarious picture opportunities. 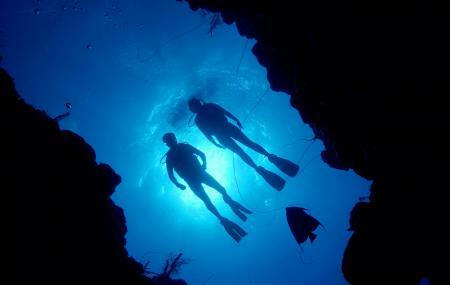 You can even go snorkelling underwater, and see the underwater life up close and personal. Each Jet Ski tour starts with a 15 minute introductory course, where beginners can quickly learn how to manoeuvre a jet ski. The Jet Ski tours will take you off the coast of the Combate Beach, and you can cruise over the waters and past nearby landmarks like the El Faro Los Marrilos Lighthouse and the Playa Sucia beach. If you have a group of people visiting, you can get some pretty sweet package deals from the operators. Head on to the Paradise Puerto Rico Water Sports for some soaking mad Puerto Rico fun! When going on a Jet Ski tour, be careful not to stray away from the group and the guide. You can book lunch/ dinner in your package as well. Starting at $10 per ride. Jetski rentals start at $90 an hour. You can go for a deluxe $350 tour, which includes everything including snorkelling as well. Love this? Explore the entire list of places to visit in Cabo Rojo before you plan your trip. Fancy a good night's sleep after a tiring day? Check out where to stay in Cabo Rojo and book an accommodation of your choice. How popular is Paradise Puerto Rico Water Sports? People normally club together El Faro Los Morrillos and Light Tackle Adventure Tarpon Fishing while planning their visit to Paradise Puerto Rico Water Sports.